Preheat the oven to 180°C/gas mark 4 and line a muffin tray with paper liners. Combine the flour, baking powder, cinnamon and salt in a large bowl. In a seperate bowl mix together the milk, eggs, vegetable oil, honey and grated courgette. Add the liquid ingredients to the dry ingredients and mix – be careful not to overmix, you just need to make sure everything is incorporated. Spoon the mixture into the cases, leaving a little space for the muffins to rise, and cover with the mixed seeds and oats. Bake for 25 minutes or until a skewer comes out clean. Cool for 5 minutes in the tray then turn out onto a wire rack to cool completely. 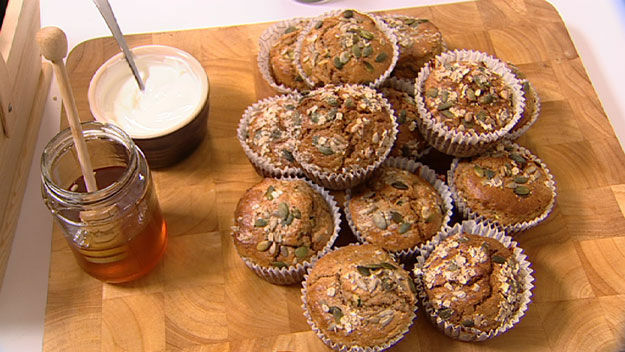 Eric’s tip: Try serving with a drizzle of honey and a spoonful of Greek yoghurt. Posted on June 27, 2012 by saritakb	• This entry was posted in Recipes and tagged baking, baking mad with eric lanlard, courgette muffins, eric lanlard, healthy baking, healthy breakfast, muffins, Olympic torch, Olympics. Bookmark the permalink.